YouTube shows a new option for long videos: a theater view that enlarges the player and fades out the rest of the page. 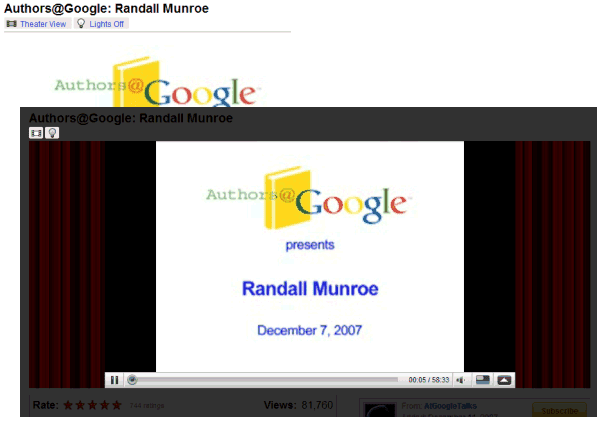 Randall Munroe's talk at Google and Steve Jobs' speech at Stanford are two examples of feature length videos that should display the new option. It's not clear how YouTube filters feature length videos, but most of them are from the Authors@Google series, Standford University, Carnegie Mellon University and Vancouver Film Studios. If you want a YouTube interface that looks more like Google Video, try the YouTube Googler Greasemonkey script. Eh. I'm still waiting for the UI to fade out in fullscreen. check this new Gmail Lab Feature its quite unique ! Great tip! Thanks for sharing the link, LifeHacked! Amit always writes interesting posts. The video doesn't get bigger, it only gets wider which to me is useless! The "lights out" thing is good though. I agree with Quentin. Ok, it might be a nice extra but doesn't really add something. Lights-out modus is great though: puts more focus on the video! When is YouTube going to add the lights off function for all the videos? The theater view looks cheesy. I like this, I want it on my long videos. I can't wait for that button to appear. i think it is very good addition.same looking theatre view.